California’s drought has caused many difficulties in the lives of residents of the state, but the damage doesn’t stop there. Plant and animal life is being affected by the lack of water in the region, and millions of trees have been lost to the increased temperature and insect infestations. Researchers estimate that millions more trees are in danger from the continued lack of water and that California’s ecosystem is in danger. Remote sensing technologies and satellite images were used to show where the drought is affecting trees the most. There has been an incredible loss of water in California’s forests compared to what water levels were at prior to drought years. 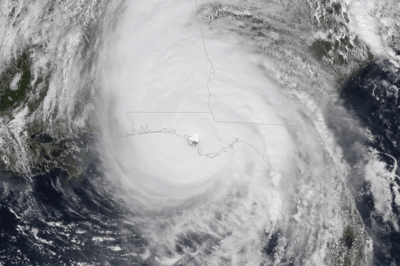 Researchers measured the amount of water contained in the forest canopy and compared it to data from 2011, 2013, and 2014. The amount of water in the canopy can be used to determine how much water a tree has stored in its leaves as well as how flammable the tree is in case of a forest fire, another threat California is facing because of the drought. Researchers found that California’s trees, nearly 58 million over 2.4 million acres, have lost over 30% of their canopy stored water in the last four years. This is a loss that researchers consider to be highly stressful conditions for the trees. Nearly 9.9 million acres of forests in California’s Central Valley showed water loss between 2011-2013, and in 2014 this water loss increased to nearly 15 million acres. Now areas of low and high elevation forests are being affected by the drought conditions. Forest canopy water loss from 2011 to 2013, 2013 to 2014, and 2014 to 2015. Black areas indicate fire extents reported between 2011 and 2015 by the US Forest Service. From Asner et al, 2015. As of the last year’s findings, 26.2 million acres of forest are now experiencing severe water loss. Researchers have produced a map that shows where water loss is most extreme alongside the spaces where fire has burned trees and beetle infestations have taken over. Researchers hope their map and information can help them determine what trees are most at risk in the next year or so, and create policies regarding what steps can be taken to help increase water retention for the benefit of California’s trees. Asner, G. P., Brodrick, P. G., Anderson, C. B., Vaughn, N., Knapp, D. E., & Martin, R. E. (2015). 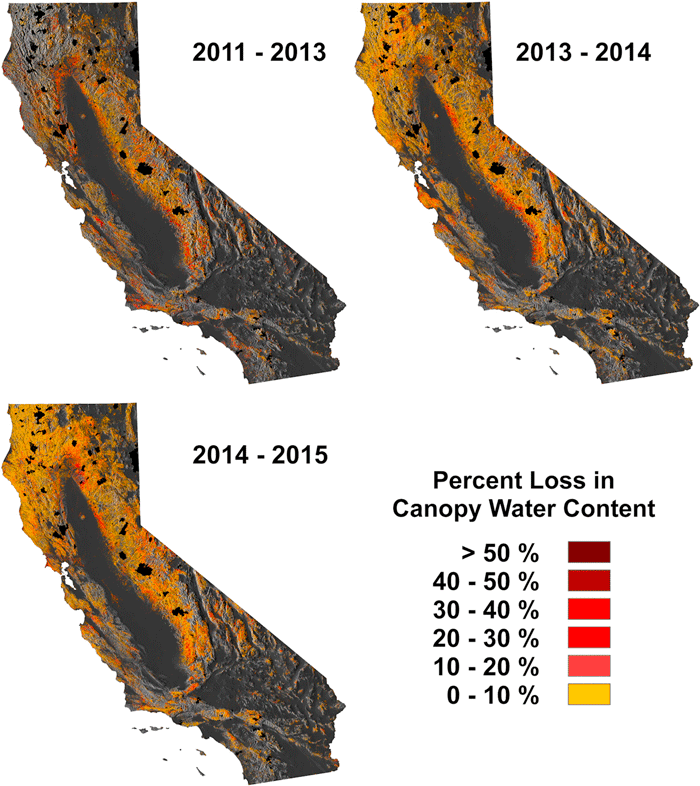 Progressive forest canopy water loss during the 2012–2015 California drought. 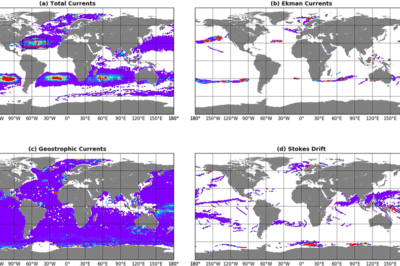 Proceedings of the National Academy of Sciences, 201523397. Greene, S. (2015, December 31). 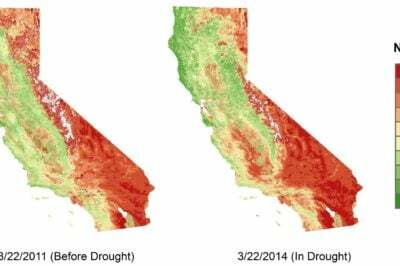 New maps show spread and impact of drought on California forests. LA Times.